In July, Vestaron launched its first product, Spear-T. Spear-T controls all four major greenhouse pests, thrips, whiteflies, aphids and two-spotted spider mites, as efficiently as synthetic pesticides, with the safety and sustainability of biologicals. 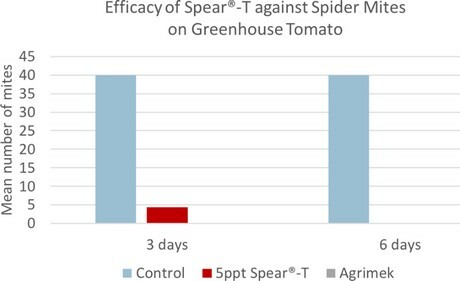 Spear-T has a safety profile towards beneficial insects and pollinators, as well as a short 4 hour re-entry interval, and 0 day pre-harvest interval. The combination of these characteristics makes Spear-T a greenhouse biopesticide that provides pest control at the level of synthetics, but is safe and sustainable, and is compatible with integrated pest management programs. Spear-T is available through Vestaron’s distribution partner Isagro USA. www.isagro-usa.com/contact-us.html. John Trumble, Distinguished Professor of Entomology, UC Riverside, used Spear-T successfully against two-spotted spider mites on vegetables. He is an internationally recognized expert in integrated pest management,chemical ecology and insect-plant interactions. In 1998 he was elected Fellow of the Entomological Society of America; since 2001 he is Editor-in-Chief of the “Journal of Economic Entomology”, the most-cited entomology journal globally. He received numerous international research awards. Rick Ouding, owner of Kalamazoo Specialty Plants in Kalamazoo, Michigan, runs a successful ornamentals business that includes about 700,000 square feet of modern greenhouse area. He uses innovative technologies for growing his greenhouse ornamentals such as LED lighting systems for flowering control, modern fogging systems for pesticide application, and innovative pesticides for control of greenhouse insect pests and spider mites. Rick Ouding recognized early on the potential of Vestaron’s Spear-T. 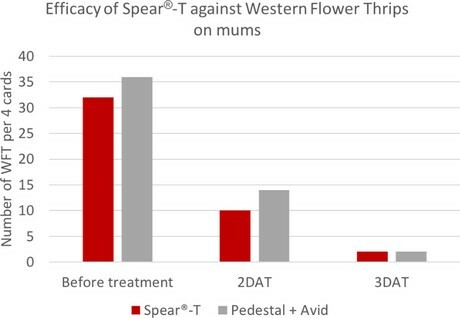 In fact, he was the first grower to observe the unique insecticidal and miticidal characteristics of Spear-T.